Sewer camera inspection has fast become one of the most valuable plumbing services for real estate owners in and around Stillwater, Oklahoma. Thanks to recent advances in technology specially manufactured, waterproof push cameras provide a way to visually inspect sewer lines and other plumbing pipe systems that are buried underground, within interior walls, and even under your foundation at your property. The entire process takes less than an hours and will discover a great deal of things about the pipes that run your plumbing systems. It all begins when a highly skilled, professionally trained technician inserts a fiber optic push rod into the pipeline through a pre-existing access point such as a drain cleanout. The push rod contains a high-resolution, waterproof video camera attached to the end. It can enter into pipes that range anywhere from two inches in diameter upwards to a full thirty-six inches. The push rod is flexible enough that it allows the camera to travel through the interior of the pipes in question, even around bends and corners. In essence the camera is able to see the entire pipe, including all of the interior surfaces. The camera is able to pan and tilt, which enables it to thoroughly inspect the sides of the pipes to see if there are any infringements of leaks. The video camera transmits real time video images back to the technician where they are viewable on portable screens. The technician is then able to determine the exact condition inside of the pipes. This feature provides them with the ability to detect any existing or even potential problems with the pipeline. The video images are also saved electronically for future use and to establish or add to the permanent record. The sewer camera inspection system also includes radio transmitter in order to record the exact location and depth of any damaged areas. This feature certainly comes in handy if and when the repair process begins. In essence the location technology allows the plumbing contractor to easily locate the damaged area of areas when it is time to fix the problem. It takes all of the guesswork out of the formula, which helps to make the necessary repair work far more efficient and less costly. 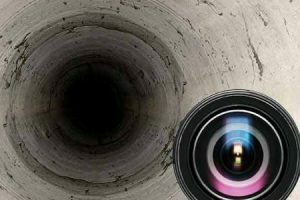 A professional sewer camera inspection will absolutely identify a variety of problems such as pipes that are broken, corroded, leaking, misaligned, punctured, or are suffering from tree root invasion. The process also identifies blockages and clogs that are caused by grease buildup, hair, and other items that are going down the drains on a daily basis. In addition, a sewer camera inspection can be used to prove that repairs were made correctly, or to verify that the pipeline was properly cleaned after a drain cleaning service. Sewer camera inspections have even be used to locate missing items of value such as jewelry. It is highly recommended to have the process performed at your property if the drains clog easily or there is a backup in the sewer system. In addition, a sewer camera inspection prior to purchasing a new property will help to ensure that the sewer system is free and clear of problems that will cost you time and money immediately or in the hear future. Nu Flow Technologies is an expert that will provide you with the most accurate sewer camera inspection available on the marketplace.